In the time when there was no bridge over the trench, when it wasn't necessary to defend the city from plague or Ottomans, in the Stone Gate lived a pious widow, Mrs. Modlar. She married young, to a much older city judge Ivan, who died at the age of 55 when a stone fell of the tower, which, after his tragic death was finally repaired after years of putting the task at the bottom of the to-do list. The poor judge's soul went to heaven. At least that was what his widow believed. In Gradec, many knew about the judge's darker side before the marriage to a younger woman. This beautiful and virtuous woman influenced the judge in a good way and in their short life together, she even managed to make him a better man, even she never truly loved that marriage and her husband. If it wasn't for her father's debt to judge Ivan, she would probably end up in a convent to serve Christ, but she respected her father's will and managed to be a good wife. Her piety was consistent and her benevolence was great and famous. Instead of children, judge left her a small chest full of gold, so she could live comfortably in her own three rooms above the Stone Gate. She even made a chapel out of one room. Religious women visited her, ate cake and praised her. In the evening she used to read scary stories by Stefan Zagrabec, and horror stories by Stefan Fucek. To two of her closest friends, she confided a secret behind the beautiful painting that hanged on the wall of her chapel: who truly prayed to Virgin Mary in front of the painting, his or her wish will be fulfilled. Katarina Moldar even proved so! Once she prayed for her neighbour's Magdic sick son and the little fella's fever disappeared. Second time, she prayed for Eva Asparger who was possessed, and there she was, walking down the street, calm and lucid. How did that particular painting ended up in widow Moldar's home? A couple of months after the judge's unfortunate accident, on Christmas Eve, widow Moldar found a gray-haired old man in front of a store nearby the Gate. Dressed only in a light flax robe, he was shivering from cold. Katarina was on her way back home from the church of St.Mark, when she felt pity upon the old man, so she invited him inside to warm up. His feet were shod in wet sandals. He drank a glass of wine, dined carp and looked at the widow with his bright eyes, and the widow felt glad that he is better. Katarina and the old man prayed to God on Christmas Eve. Old man even recited St Paul's first letter to the Romans. In the first hour of Christmas, she made a bed for the old man and set him to sleep. He felt grateful and fell asleep right away. With the first light of morning, Katarina got out of her bed, set ham and cake on the table and waited for the old man to get up. Time passed and around 8 o'clock she took a peek at his room and was surprised by the scene. On the neat bed it looked like no one had slept, and instead of the old man, a painting of a Virgin Mary with a Child lay. Virgin Mary looked stunningly beautiful, in a red dress, her feet on the moon's crest, young as a girl and gentle as love, with fuzz brown hair, red lips and a smile in her eyes. Her eyes were so alive that the widow couldn't look away for hours! Katarina framed the painting and prayed in front of it every morning end evening. 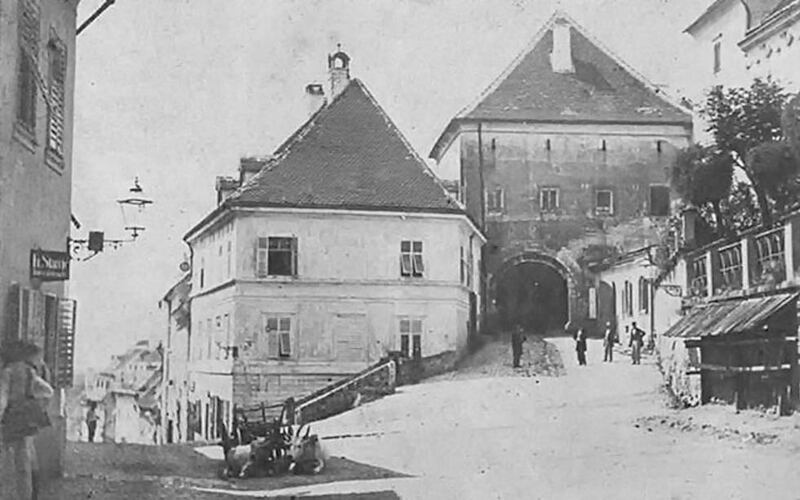 In 1731. a great fire broke out in Gradec. City fires were common on Gric and Kaptol during that time, but this time St Florian was helpless. In the said year, that fire was far worst that any other before, and it started at the St. Joseph Seminary. Torpid warrior Klement Lukovic's head hit the table and his right hand swept a candle on a heap of old papers. Yellow paper turned into a serious fire which spreader to the shelf and then onto the ceiling. By pure luck, father Kamilo wasn't asleep, so he woke up the students, who jumped out of the windows. Bells rang from the church of St Mark, citizens woke up and ran to the streets to put the fires out. They collected water from wells and made a cordon all the way to Medvescak, passing by buckets of cold water, but alas, it was too late. A strong wind blew, changed direction and the fire spread on nearby houses, down the Gospodska, Kapucinska and Kamenita streets. Around 50 buildings burnt down, including several citizens. One of the victims was petty trader Judita Bedekovic, who grotesquely enjoyed the suffering of witches on bonfire, and a general conclusion of citizens was that she got what she earned for. Widow Modlar wasn't at home that night. She was out of town for several days, praying in Trski Vrh and staying at her family in Krapina, where she heard about the terrible fire. She immediately went home to find Stone Gate looking up to heavens, as a long time ago without a roof. The fire burnt the roof, all wooden parts of the building, doors, furniture, chapel, paintings and a small chest. Fortunately there was no money in the chest, because widow hid the gold in a cellar, as always when she would go on a pilgrimage. She stood there with her spirit broken, sad over the remains of her home, but she didn't cry to the heavens and ask the Lord why. She was sure that everything happens at the will of God, whose ways are mysterious. She prayed at the site of fire: "God who makes us better by punishing us, by forgiveness support us, give your humble servants to rejoice to the peace and enjoy in gifts of your kindness." At that moment the rainy clouds that saved the city dispersed and the sun showed up. Right there, where widow Moldar's chapel used to be, a small piece of red cloth appeared under grey ashes. Katarina stepped over a black, sticky beam, moved the ashes and cried of happiness! The painting of Virgin Mary with the Child was undamaged! "Slika Majka Božja od Kamenitih vrata" by Ex13 - Licensed under Public Domain via Wikimedia Commons. Tired, desperate and sad for their losses, citizens gathered to see what is going on, but when they witnessed a miracle they fell on their knees and a new hope filled their hearts.It may have been a sign that this was the last time a fire would devour Gric. They will build better and more beautiful houses, and the painting will protect the city from troubles. Widow understood the message that the painting wasn't her any more and belonged to her city. With the remaining gold, she built an altar in the Stone Gate and placed the painting on it. Virgin's smiling eyes were protecting the city and the Stone Gate. After 100 years, when city council wanted to demolish the Stone Gate, Horbel who promoted the idea got sick and soon dried like a tobacco leaf. Same mysterious disease happened to trader Jaksic, who offered to cover the cost of demolishing the Gate. Two hundred years after the miracle happened, Virgin Mary and baby Jesus were crowned with golden crowns, because no one ever heard that kind Mother refused a prayer.